A combination of contractor software, people, processes, and training help construction businesses improve efficiency through standardized, repeatable practices. This guide reveals six ways you can more easily implement technology and standardize processes necessary to unleash your full sales and profit potential. The guide presents the value of an owner’s commitment to change, the purpose of key influencers, the impact of training, how to secure buy-in from team members, and how to reward behavior that supports transformative change. 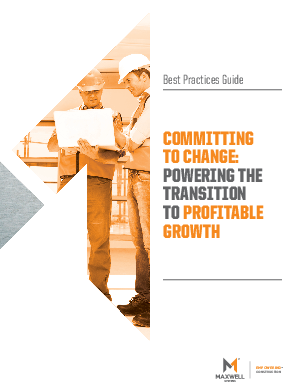 Download the free best practices guide, “Committing to Change: Powering the Transition to Profitable Growth,” for practical advice you can consider for your business today.